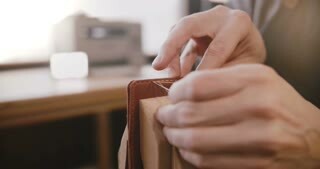 Close-up shot of male hands sewing handmade leather bag on saddler with needle in manufacturing workshop startup space. 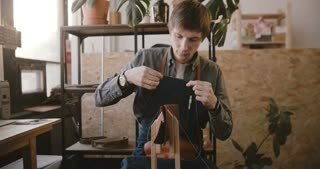 Professional male artisan sewing handmade leather goods on saddler with needles in light modern manufacturing workshop. Close-up camera tilts up on male artisan adjusting leather sewing saddler before working in light manufacture workshop. Close-up camera tilts up from brown leather shoe to male artisan hands adjusting leather sewing saddler in workshop. 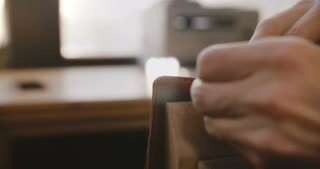 Close-up shot of male hands sewing handmade leather goods on saddler with needles in co-working manufacturing workshop. 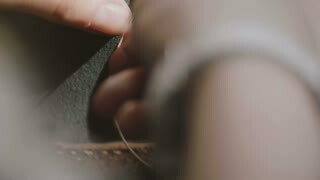 Close-up shot of male hands sewing handmade leather bag on saddler with needles in light modern manufacturing workshop. 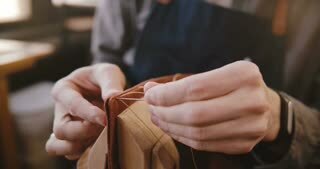 Super close-up shot of skilled artisan hands sewing a traditional fashionable organic handmade leather bag with needles. 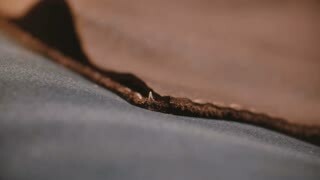 Macro close-up detailed shot of female hands sewing handmade rough edges of leather bag with needle and waxed string. Macro close-up detailed shot of female fingers sewing rough edge handmade leather bag with needle and waxed string.